After serving as interim, David Kirkpatrick was recently named head of the Department of Biology Teaching and Learning. Kirkpatrick joined the CBS faculty in the Department of Genetics, Cell Biology and Development in 2000 where he focused his research on DNA mutation. We recently caught up with Kirkpatrick to get his thoughts on BTL and areas the department plans to focus on in the near future. BTL is the first-of-its kind in higher education. What should the University community know about the department? The field of biology education research, as a subset of the wider field of discipline-based education research (DBER), is quite new compared to all of the other areas of biology research. 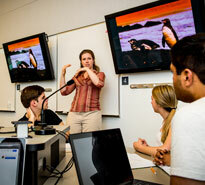 Nationally, biology departments increasingly have one or two faculty devoted to education research; BTL is unique in bringing many people together as a full department. Even though we are very young, BTL is already recognized nationally as a leader in the field, and we’re just getting started. All of our members are committed to the twin goals of the department - investigating the factors that influence how students learn biology, and implementing the outcomes of that research in the classroom, to give CBS undergraduates the best learning environment we can provide. You have served as interim head of the department for the past two years. What opportunities do you see for the department going forward? As a new department we are focusing on expanding BTL’s research mission, to complement our reputation for excellence in teaching. We have recruited outstanding junior faculty working on student-teacher interactions, exploring aspects of the classroom experience that impede student progress, fostering enhanced quantitative knowledge gains, expanding open-ended research experiences in laboratory courses, and developing cutting-edge physiology courses and labs. We expect to hire two new tenure-track faculty who will bring new expertise into the department, such as researching differences in learning strategies in online and in-person biology courses. Your background and research to date has focused on DNA mutation during meiotic recombination. Do you plan to integrate research in teaching and learning into your research program? I’ve been conducting biology education research on a small scale, and I will be expanding that research while the head of BTL. My primary interest is in programmatic assessment. Just as we assess how students are doing in a course, we can assess the courses and curricula that CBS offers. To that end, in 2015 I initiated a college-wide Knowledge Assessment consisting of 42 senior-level questions that cover the range of topics students encounter as biology majors. 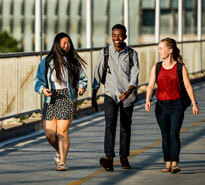 All CBS undergraduates take it as entering freshmen at Itasca as part of the Nature of Life experience, at the end of their sophomore year, and just before they graduate. From these data I can ask how well cohorts of students are learning a particular topic (ecology, biochemistry, etc) and identify areas in our curriculum that may need some attention. You are leading development of the new Center for Online Biology Education. Can you expand a bit on this resource and what you see it becoming? Undergraduate biology education is moving rapidly towards a mixed use model incorporating both online and in-person learning experiences. The Center for Online Biology Education (COBE) started as a joint venture between BTL and GCD, to serve as a hub for online instruction in the College. Members of COBE will serve as mentors to instructors who are interested in offering an online course, in the same way that we partner new instructors with experienced instructors when they initially begin teaching. Along with mentoring and new course development, COBE will help ensure that existing courses have the most up-to-date technical and educational resources possible, in order to provide the best online education experience for our students.